One of the least explored avenues in ancient Indus research, one which would so clearly reinforce the available evidence for the long, deep local roots of Indus civilization stretching back deep into the Stone Age (25,000-30,000 years back), when "primitive" tribes painted their stories on rock faces all over India. 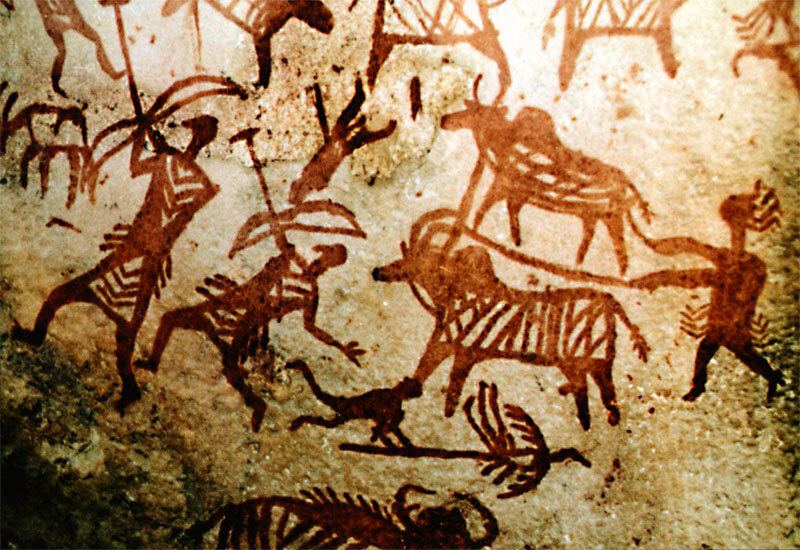 "India is one of the regions in the world where Stone Age paintings have survived in great numbers and in astonishingly well-reserved state," writes Erwin Neumayer, author of Prehistoric Rock Art of India (p. ix) and other books on this enormous and little understood subject. Neumayer is one of the most unique scholars of ancient Indian history, one who has spent thousands of hours carefully reading and transcribing drawings made by our ancestors in rock cliffs, deep caves and exposed stone surfaces from the Karakorams to Bhopal, from the southern Deccan to Nepal. Alone he has saved and preserved thousands of images as a personal crusade, much like the leading Indian discoverers of these drawings like V.S. Wakankar, to whom Neumayer's book is dedicated, and other greats in the field whose life works contribute to the record in Prehistoric Rock Art of India. It's hard to look at these images and not think that there are deep similarities with ancient Indus iconography. The intricate design patterns of Mesolithic art (10,000-5,000 BCE) mesmerize; there is the figure with the bow and arrow; the side profile nature of animal depictions, especially bovines carried through to seals; a hunter spearing a buffalo; bangled women; the ubiquitous use of red oxide paint. It does not seem irrational to suppose a continuity between Neolithic, Mesolithic and later Indus iconography, a continuity from which nearly all traces have been lost to archaeology and science. Except for these rock paintings, that is. "Depictions of bulls with decorated horns constitute a prominent feature of Chalcolithic rock art [from around 2500 BCE, the Indus period]. The humped bull obviously held a pivotal position in religious symbolism. It is likely that the bull symbolized a deity, which is at times expressed in a symbolic dualism between a hero and a bull. This symbolism is also seen on Indus valley seals and in paintings on Chalcolithic pottery from the early Neolithic cultures of western South Asia" writes Neumayer (p. 194, C002, Figures 1. and 2. below). Then there are multi-level narrative pieces like this one: "The composition has several thematic and directional orientations. The centre of the composition seems to be made up by the man driving two yoked cattle. The man sports frizzy hair and decorations on his middle. The cattle move towards one other man who also drives two yoked cattle. Around these groups are several cattle with prominent humps. Below this are deer and other smaller wild animals. Two hunters with a bow and arrow held ready are moving towards this group. Below the ploughman is a large wild buffalo and below this is a file of monkeys preceded by a dog (? 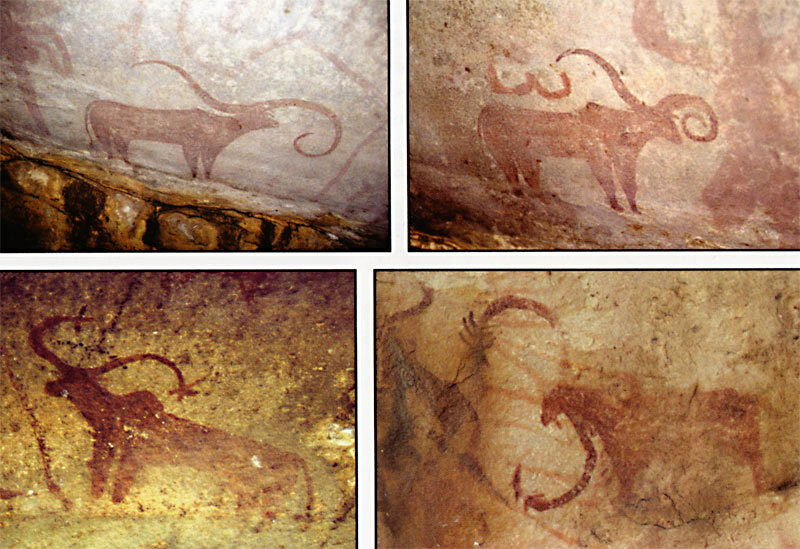 ), a peacock, a boar and several antelopes (? ), all moving against the direction of the ploughman. 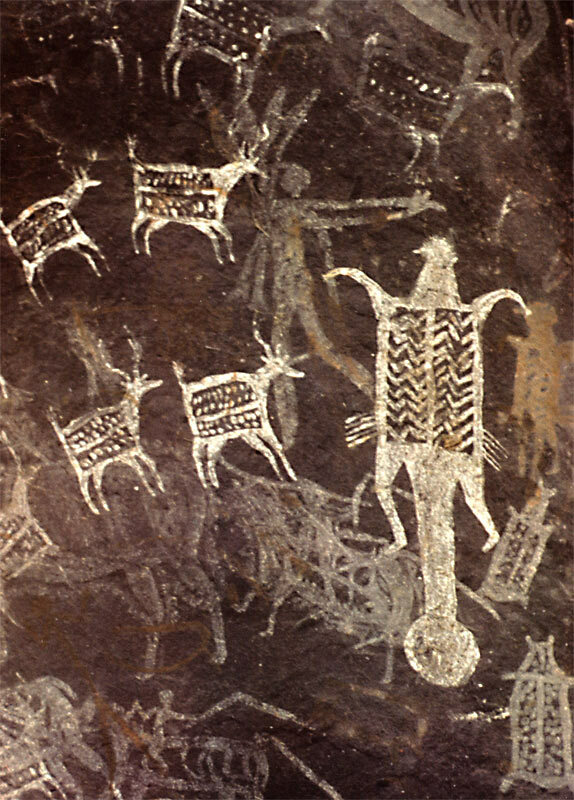 (p. 202, C047)"
Illustrations are all from Erwin Neumayer's Prehistoric Rock Art of India (2013). 3. The ithyphallic Hero surrounded by - or confronting - animals. Satkunda, Chalcolithic, Height of the person 25 cm. C035. 4. Deity of the 'Pashupatinath-type' with a wide out-loading horn-crown from which emanate plant-sprouts. 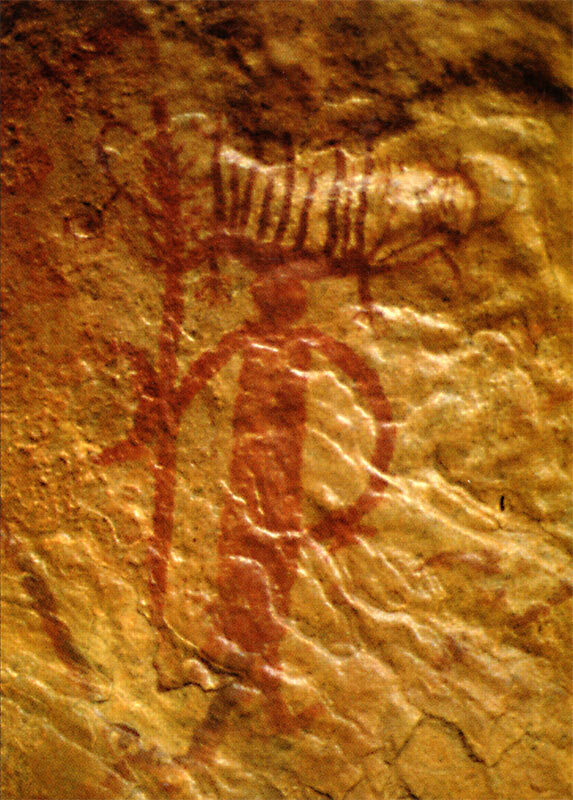 In his right hand he holds a staff with upwards directed prongs and a serrated scythe (?). From the deity's phallus emanates a line that encircles animals and smaller deities. This picture was found under a rocky ledge which forms a waterfall during the rains. A heavy encrustation covers the pictures. Bundi, Mahadeo Pani, Chalcolithic, Height 50 cm. C022. 5. A pair of yoked humped cattle. Raisen-Ramchaja, Raisen, Chalcolithic, Red, length of bovid ca. 20 cm. C047.